For us South Indian cuisine is much more than idli and dosa...we prepare and enjoy them regularly at home. While Appam- stew, Idiyappam- spicy egg roast etc are often prepared for dinner and Idli, dosa, utthapam, paniyaram for breakfast but for lunch we love a combination of curries, rasam, smabhar, fries, fish curry etc with rice. One of our most favourite meal combination is Rice, sambhar, Rasam, Potato roast, beans/cabbage thoran, Fish fry/ fish curry and Neer mor or spiced buttermilk. Though we often categorise these flavours as South Indian but there are significant differences in cooking techniques and ingredients in these four states. 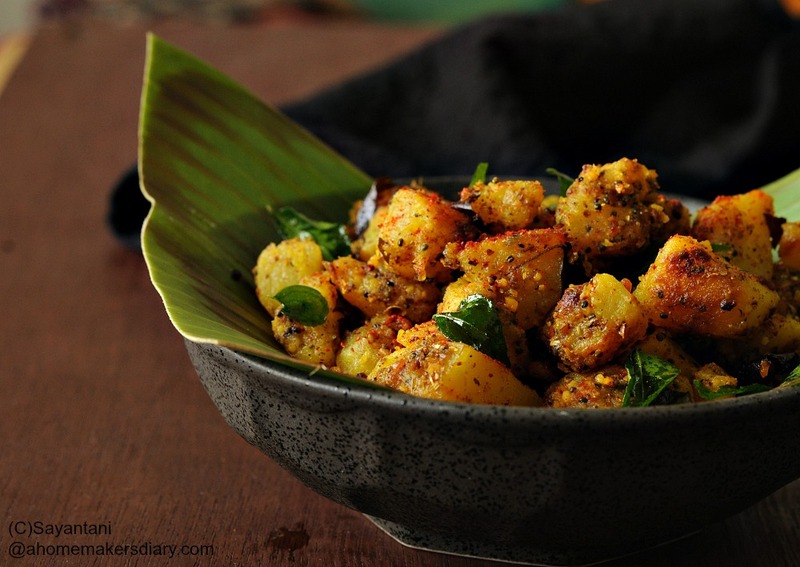 This particular one is a Tamil dish where a spicy spice and lentil powder is sprinkled on the potatoes just before finishing it. I adapted this potato roast recipe from Radhika's page and we love it this way. 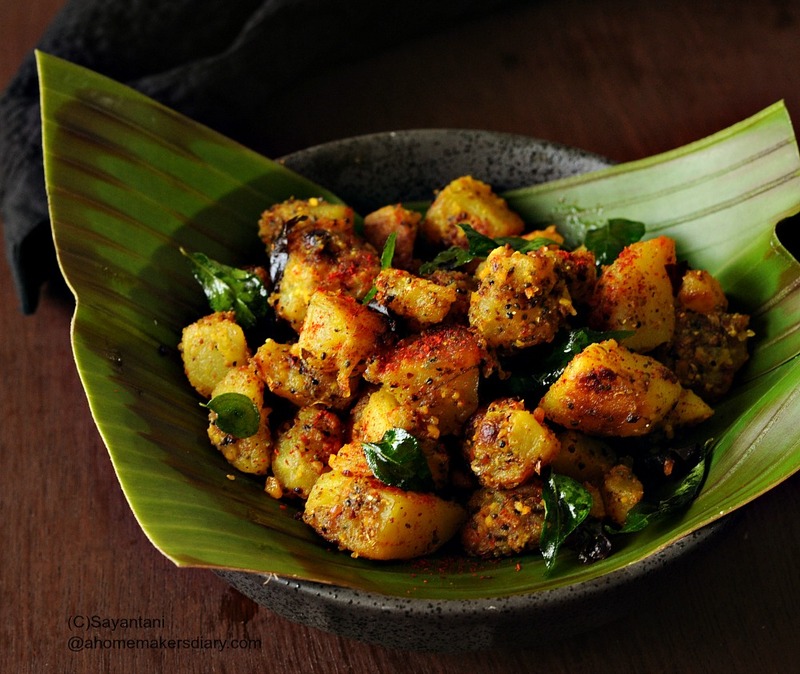 Make it if you are fond of the south Indian flavours of curry leaves and hing-mustard tadka. Wash and cook the potatoes till cooked through but not mushy. Peel and chop in small cubes. Keep aside. In a pan heat 1 tsp oil and roast the spices till aromatic. (on low flame it should take 4-5 minutes). Cool it and then grind to a coarse powder. Keep aside. Heat 1 tbsp oil and temper with the Chana dal. When the dal starts to brown add the mustard and cumin seeds, followed by chillies, curry leaves and asafetida. Let the psices pop and then add the chopped potatoes. Sprinkle salt and turmeirc and cook on medium flame. A heavy based iron pan will make sure you dont have to use too much oil. Cook for 10-12 minutes or till the potatoes look somehow crusty. Sprinkle the spice powder and stir to coat. Adjust salt and serve hot with rice and Dal. Potatoes are such a versatile veggie! There are so many ways you can make them:) The spicy roast looks fabulous!